Deuterium (chemical symbol D or ²H) is a stable isotope of hydrogen, found in extremely small amounts in nature. The nucleus of deuterium, called a deuteron, contains one proton and one neutron, whereas the far more common hydrogen nucleus contains just one proton and no neutrons. Consequently, each atom of deuterium has roughly twice the mass of an ordinary hydrogen atom, and deuterium is also called heavy hydrogen. Water in which ordinary hydrogen atoms are replaced by deuterium atoms is known as heavy water. Scientists have developed a variety of applications for deuterium and its compounds. For example, deuterium serves as a nonradioactive isotopic tracer to study chemical reactions and metabolic pathways. In addition, it is useful for the study of macromolecules by neutron scattering. Deuterated solvents (such as heavy water) are routinely used in nuclear magnetic resonance (NMR) spectroscopy, because these solvents do not interfere with the NMR spectra of the compounds being studied. Deuterated compounds are also useful for femtosecond infrared spectroscopy. By measuring small variations in the natural abundance of deuterium, as well as variations of the stable heavy oxygen isotopes 17O and 18O, researchers can trace the geographic origins of Earth's waters. Deuterium is also a fuel for nuclear fusion reactions, which could someday be harnessed for commercial-scale power generation. The name of deuterium is derived from the Greek word deuteros, meaning "second." It indicates that deuterium, with an atomic nucleus composed of two particles, is the second isotope after ordinary (or light) hydrogen. Deuterium is frequently represented by the chemical symbol D. As an isotope of hydrogen with mass number 2, it is also represented as ²H. The International Union of Pure and Applied Chemistry (IUPAC) allows both D and ²H, although ²H is preferred. The reason deuterium has a distinct chemical symbol may be its large mass difference with hydrogen-1 (¹H), also known as protium. Deuterium has a mass of 2.014 atomic mass units (u), compared to protium's mass of 1.007825 u, and the mean hydrogen atomic weight of 1.007947 u. By comparison, the weight ratios of stable or long-lived isotopes of each of the other chemical elements are mostly insignificant, which could explain the lack of unique isotope symbols elsewhere. Deuterium occurs in trace amounts naturally as deuterium gas, written as ²H2 or D2. However, most deuterium atoms in the universe are bonded with typical ¹H atoms to form the gas called hydrogen deuteride (HD or ¹H²H). The abundance of deuterium in the oceans of Earth is approximately one atom in 6500 hydrogen atoms (about 154 parts per million (ppm)). Deuterium thus accounts for approximately 0.015 percent (on a weight basis, 0.030 percent) of all naturally occurring hydrogen atoms in the oceans on Earth; the abundance changes slightly from one kind of natural water to another. The abundance of deuterium on Jupiter is about 6 atoms in 10,000 (0.06 percent atom basis). There is little deuterium in the interior of the Sun, because thermonuclear reactions destroy it. However, it persists in the outer solar atmosphere at roughly the same concentration as in Jupiter. The existence of deuterium on Earth, elsewhere in the Solar System (as confirmed by planetary probes), and in stars (as indicated by their spectra), is an important piece of information in cosmology. Stellar fusion destroys deuterium, and there are no known natural processes (such as cluster decay), other than the Big Bang nucleosynthesis process, which might have produced deuterium at anything close to its observed natural abundance. This abundance seems to be a very similar fraction of hydrogen, wherever hydrogen is found. Thus, the existence of deuterium at its present abundance is one of the arguments in favor of the Big Bang theory over the steady state theory of the universe. It is estimated that the abundances of deuterium have not changed significantly since their production more than 14 billion years ago. The world's leading "producer" of deuterium (technically, enricher or concentrator of deuterium) was Canada, until 1997, when the last plant was shut down. Canada uses heavy water as a neutron moderator for the operation of its CANDU reactors. Currently, India is probably the world's largest concentrator of heavy water, also used in nuclear power reactors. The existence of nonradioactive isotopes of lighter elements had been suspected in studies of neon as early as 1913, and proven by mass spectroscopy of light elements in 1920. The prevailing theory at the time, however, was that the isotopes were due to the existence of differing numbers of "nuclear electrons" in different atoms of an element. It was thought that hydrogen, with a measured average atomic mass very close to 1 u, and a nucleus thought to be composed of a single proton (a known particle), could not contain nuclear electrons, and thus could have no heavy isotopes. Deuterium was predicted in 1926 by Walter Russell, using his "spiral" periodic table. It was first detected spectroscopically in late 1931 by Harold Urey, a chemist at Columbia University. Urey's collaborator, Ferdinand Brickwedde, distilled five liters of cryogenically produced liquid hydrogen to 1 milliliter (mL) of liquid, using the low-temperature physics laboratory that had recently been established at the National Bureau of Standards (now the National Institute of Standards and Technology) in Washington, D.C. In this manner, Brickwedde concentrated the fraction of mass-2 isotope of hydrogen to a degree that made its spectroscopic identification unambiguous. Urey called the isotope "deuterium" from the Greek word for "second." The amount inferred for normal abundance of this heavy isotope was so small (only about 1 atom in 6400 hydrogen atoms in ocean water) that it had not noticeably affected previous measurements of (average) hydrogen atomic mass. Urey was also able to concentrate water to show partial enrichment of deuterium. Gilbert Newton Lewis prepared the first samples of pure heavy water in 1933. The discovery of deuterium, coming before the discovery of the neutron in 1932, was an experimental shock to prevailing theory. After the neutron was reported, deuterium won Urey the Nobel Prize in chemistry in 1934. Shortly before World War II, Hans von Halban and Lew Kowarski moved their research on neutron moderation from France to England, smuggling the entire global supply of heavy water (made in Norway) across in twenty-six steel drums. During World War II, Nazi Germany was known to be conducting experiments using heavy water as moderator for a nuclear reactor design. Such experiments were a source of concern because they could have allowed the Germans to produce plutonium for an atomic bomb. Ultimately, it led to (what seemed important at that time) the Allied operation called the "Norwegian heavy water sabotage," the purpose of which was to destroy the Vemork deuterium production/enrichment facility in Norway. After World War II ended, the Allies discovered that Germany had not been putting as much serious effort into the program as had been previously thought. The Germans had only partially completed a small experimental reactor that had been hidden away. By the end of the war, the Germans did not even have a fifth of the amount of heavy water needed to run the reactor, partly as a result of the Norwegian heavy water sabotage operation. However, had the Germans succeeded in getting a reactor operational (as the U.S. did with a graphite reactor in late 1942), they would still have been at least several years away from development of an atomic bomb with maximal effort. The engineering process, even with maximal effort and funding, required about two and a half years (from first critical reactor to bomb) in both the U.S. and U.S.S.R, for example. The color, odor, and various chemical properties of deuterium are similar to those of protium. However, some of the physical properties of deuterium and its compounds differ from those of their ordinary hydrogen analogs. For example, the melting point of deuterium is -426°F (-254°C), whereas that of protium is -434°F (-259°C); and the boiling point of deuterium is -417°F (-249°C), whereas that of protium is -423°F (-253°C). Deuterium atoms can replace normal hydrogen atoms in water molecules to form heavy water (D2O), which is about 10.6 percent denser than normal water. Consequently, ice made from heavy water sinks in ordinary water. Also, heavy water is slightly toxic in eukaryotic organisms, with 25 percent substitution of the body water causing cell division problems and sterility, and 50 percent substitution causing death by cytotoxic syndrome (bone marrow failure and gastrointestinal lining failure). Prokaryotic organisms, however, can survive and grow in pure heavy water (though they grow more slowly). It appears that consumption of heavy water does not pose a health threat to humans unless very large quantities (in excess of 10 liters) were consumed over many days. Small doses of heavy water (a few grams in humans, containing an amount of deuterium comparable to that normally present in the body) are routinely used as harmless metabolic tracers in humans and animals. Density: 0.180 kg/m³ at standard conditions for temperature and pressure (STP) (0 °C, 101.325 kPa). Mean abundance in ocean water (see VSMOW) about 0.0156 percent of H atoms = 1/6400 H atoms. The nuclear magnetic resonance (NMR) frequency of deuterium is significantly different from that of common light hydrogen. Infrared spectroscopy also easily differentiates many deuterated compounds, because there is a large difference in infrared absorption frequency between the vibration of a chemical bond involving deuterium versus a bond involving light hydrogen. The two stable isotopes of hydrogen can also be distinguished by mass spectrometry. Emission spectrum of an ultraviolet deuterium arc lamp. Deuterium and its compounds are useful for a variety of applications. For example, in chemistry and biochemistry, deuterium is used as a nonradioactive isotopic tracer in molecules to study chemical reactions and metabolic pathways. Chemically, deuterium behaves much like ordinary hydrogen, but it can be distinguished from ordinary hydrogen by its mass, using mass spectrometry or infrared spectrometry. Neutron scattering techniques particularly benefit from the availability of deuterated samples. The H and D cross-sections are very distinct and different in sign, which allows contrast variation in such experiments. 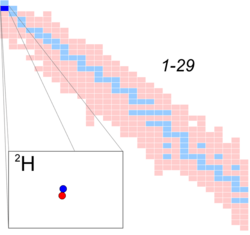 Further, a nuisance problem of ordinary hydrogen is its large incoherent neutron cross-section, which is nil for D and delivers much clearer signals in deuterated samples. Hydrogen occurs in practically all organic chemicals and biochemicals, but it cannot be seen by X-ray diffraction methods. Hydrogen can be seen by neutron diffraction and scattering, which makes neutron scattering, together with a modern deuteration facility, indispensable for many studies of macromolecules in biology and other fields. Deuterated solvents (including heavy water and compounds like deuterated chloroform, CDCl3) are used in hydrogen nuclear magnetic resonance spectroscopy (proton NMR). NMR ordinarily requires compounds of interest to be analyzed after being dissolved in solution. Because deuterium's nuclear spin properties differ from those of light hydrogen present in organic molecules, NMR spectra of hydrogen/protium are clearly distinguishable from those of deuterium. 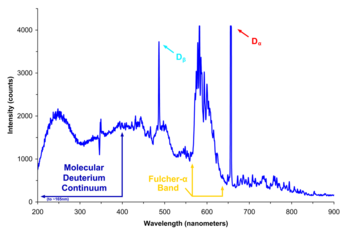 In practice, deuterium is not "seen" by an NMR instrument tuned to light-hydrogen. A deuterated solvent therefore allows the light-hydrogen spectrum of the compound of interest to be measured, without interference from the solvent. Deuterated compounds can also be used for femtosecond infrared spectroscopy, because the mass difference (compared to protium-containing compounds) drastically affects the frequency of molecular vibrations. Deuterium-carbon bond vibrations are found in locations free of other signals. Deuterium is a fuel for nuclear fusion reactions, especially in combination with tritium, because of the high reaction rate (or nuclear cross section) and high energy yield of the D-T reaction. Unlike protium, deuterium undergoes fusion solely by the strong interaction, making its use for commercial power plausible. Measurements of small variations in the natural abundance of deuterium, along with those of the stable heavy oxygen isotopes 17O and 18O, are of importance in hydrology, to trace the geographic origins of Earth's waters. The heavy isotopes of hydrogen and oxygen in rainwater (also called meteoric water) are enriched as a function of the environmental temperature of the region in which precipitation occurs (and thus enrichment is related to mean latitude). The relative enrichment of heavy isotopes in rainwater (as referenced to mean ocean water), when plotted against temperature, falls predictably along a line called the global meteoric water line (GMWL). This plot allows samples of precipitation-originated water to be identified along with general information about the climate in which it originated. Evaporative and other processes in bodies of water, and also groundwater processes, also differentially alter the ratios of heavy hydrogen and oxygen isotopes in fresh and salt waters, in characteristic and often regionally distinctive ways. The proton and neutron making up the deuterium nucleus can be dissociated through neutral current interactions with neutrinos. The cross-section for this interaction is comparatively large, and deuterium was successfully used as a neutrino target in the Sudbury Neutrino Observatory experiment. Deuterium is one of only four stable nuclides (2H, 6Li, 10B, 14N) with an odd number of protons and odd number of neutrons. (Also the long-lived radioactive nuclides 40K, 50V, 138La, 180mTa occur naturally and have the odd-odd combination of protons and neutrons.) Most odd-odd nuclei are unstable with respect to beta decay, because the decay products are even-even, and are therefore more strongly bound, due to nuclear pairing effects. Deuterium, however, benefits from having its proton and neutron coupled to a spin-1 state, which leads to stronger nuclear attraction between the particles. Given that the proton and neutron are similar to each other in mass and nuclear properties, they are sometimes considered two symmetric types of the same object, a nucleon. Although only the proton has an electric charge, this is often neglected for nuclear interactions, because of the weakness of the electromagnetic interaction relative to the strong nuclear interaction. The symmetry relating the proton and neutron is known as isospin, denoted by the symbol . The symmetry of isospin is SU(2), like that of ordinary spin, so the two are mutually analogous. The proton and neutron form an isospin doublet, with a "down" state being a neutron, and an "up" state being a proton. This is a nucleus with one proton and one neutron, that is, a stable deuterium nucleus. The triplet state consists of three types of nuclei: a highly excited state of the deuterium nucleus; a nucleus with two protons; and a nucleus with two neutrons. These three types of nuclei are not stable or nearly stable. The total wave function of both the proton and neutron must be antisymmetric, because they are both fermions. Apart from their isospin, the two nucleons also have spin and spatial distributions of their wave function. The latter is symmetric if the deuteron is symmetric under parity (i.e. have an "even" or "positive" parity), and antisymmetric if the deuteron is antisymmetric under parity (i.e. have an "odd" or "negative" parity). The parity is fully determined by the total orbital angular momentum of the two nucleons: if it is even, then the parity is even (positive); and if it is odd, the parity is odd (negative). Symmetric spin and symmetric under parity: In this case, the exchange of the two nucleons will multiply the deuterium wave function by (-1) from isospin exchange, (+1) from spin exchange, and (+1) from parity (location exchange), for a total of (-1) as needed for antisymmetry. Antisymmetric spin and antisymmetric under parity: In this case, the exchange of the two nucleons will multiply the deuterium wave function by (-1) from isospin exchange, (-1) from spin exchange, and (-1) from parity (location exchange), again for a total of (-1) as needed for antisymmetry. In the first case, the deuteron is a spin triplet, so that its total spin s is 1. It also has an even parity and therefore even orbital angular momentum l. The lower its orbital angular momentum, the lower its energy. Therefore the lowest possible energy state has s = 1, l = 0. In the second case, the deuteron is a spin singlet, so that its total spin s is 0. It also has an odd parity and therefore odd orbital angular momentum l. Therefore the lowest possible energy state has s = 0, l = 1. Because the nuclear attraction is stronger when s = 1, the deuterium ground state has the values s = 1, l = 0. The same considerations lead to the possible states of an isospin triplet having s = 0, l = even; or s = 1, l = odd. Thus the state of lowest energy has s = 1, l = 1, higher than that of the isospin singlet. The analysis just given is only approximate, because isospin is not an exact symmetry, and more importantly because the strong nuclear interaction between the two nucleons is related to angular momentum in a way that mixes different s and l states. That is, s and l are not constant in time, and over time, a state such as s = 1, l = 0 may become a state of s = 1, l = 2. Parity is still constant in time, so these do not mix with odd l states (such as s =0, l =1). Therefore the quantum state of the deuterium is a superposition (a linear combination) of the s =1, l =0 state and the s =1, l =2 state, even though the first component is much bigger. Since the total angular momentum j is also a good quantum number (it is a constant in time), both components must have the same j, and therefore j =1. This is the total spin of the deuterium nucleus. To summarize, the deuterium nucleus is antisymmetric in terms of isospin, and has spin 1 and even (+1) parity. The relative angular momentum of its nucleons l is not well defined, and the deuterium nucleus is a superposition of mostly l = 0 with some l = 2. The measured value of the deuterium magnetic dipole moment, in nuclear magneton units, is 0.857. This suggests that the state of the deuterium is indeed only approximately s =1, l =0 state, and is actually a linear combination of (mostly) this state with s =1, l =2 state. The measured electric quadrupole of the deuterium is 0.2859 e fm², where e is the proton electric charge and fm is fermi. While the order of magnitude is reasonable, since the deuterium radius is of order of 1 fermi (see below) and its electric charge is e, the above model does not suffice for its computation. More specifically, the electric quadropole does not get a contribution from the l =0 state (which is the dominant one) and does get a contribution from a term mixing the l =0 and the l =2 states, because the electric quadrupole operator does not commute with angular momentum. The latter contribution is dominant in the absence of a pure l =0 contribution, but cannot be calculated without knowing the exact spatial form of the nucleons wave function inside the deuterium. An antideuteron is the antiparticle of the nucleus of deuterium, consisting of an antiproton and an antineutron. The antideuteron was first produced in 1965 at the Proton Synchrotron at CERN and the Alternating Gradient Synchrotron at Brookhaven National Laboratory. A complete atom, with a positron orbiting the nucleus, would be called antideuterium, but antideuterium has not been created as of 2005. The symbol for antideuterium is the same as for deuterium, except with a bar over it. Deuterium atoms can be absorbed into a palladium (Pd) lattice. They are effectively solidified as an ultrahigh-density lump of deuterium lump, called pycnodeuterium, inside each octahedral space within the unit cell of the Pd host lattice. The authors believe this can be used as a nuclear fuel to perform cold fusion. Although this mechanism results in high concentrations of deuterium, the possibility of cold fusion has not been generally accepted within the scientific community. ↑ Deuteros. Studylight.org. Retrieved June 7, 2008. ↑ Provisional Recommendations. Nomenclature of Inorganic Chemistry, Chemical Nomenclature and Structure Representation Division, IUPAC. Retrieved June 7, 2008. ↑ IUPAC Commission on Nomenclature of Inorganic Chemistry. 2001. Names for Muonium and Hydrogen Atoms and their Ions. Pure and Applied Chemistry 73:377–380. Retrieved June 7, 2008. ↑ See Vienna Standard Mean Ocean Water (VSMOW). ↑ Hubble measures deuterium on Jupiter - Hubble Space Telescope. Science News, Oct 5, 1996, at BNET. Retrieved June 7, 2008. ↑ These ratios presumably reflect the early solar nebula ratios, and those after the Big Bang. ↑ Lawrence M. Krauss, and Robert J. Scherrer. 2008. The End of Cosmology? Scientific American Retrieved June 7, 2008. ↑ See more in the heavy water article. ↑ Lucy Sherriff, 2002. Royal Society unearths top secret nuclear research. The Register. Retrieved June 8, 2008. ↑ 2002. The Battle for Heavy Water Three physicists' heroic exploits. CERN Bulletin. Retrieved June 8, 2008. ↑ Deuterium - Properties And Preparation. Retrieved June 12, 2008. ↑ D.J. Kushner, Alison Baker, and T. G. Dunstall. 1999. Pharmacological uses and perspectives of heavy water and deuterated compounds. Can. J. Physiol. Pharmacol. 77(2):79–88. ↑ There is an even higher-yield D-He3 fusion reaction, though the break-even point of D-He3 is higher than that of most other fusion reactions. This fact, along with the scarcity of He3, makes it implausible to use this reaction as a practical power source at least until D-T and D-D fusion reactions have been performed on a commercial scale. ↑ Oxygen – Isotopes and Hydrology. SAHRA. Retrieved June 7, 2008. ↑ T. Massam, et al. 1965. Experimental observation of antideuteron production. Il Nuovo Cimento 39: 10–14. ↑ Alternating Gradient Synchrotron. Brookhaven National Laboratory. Retrieved June 12, 2008. ↑ D. E. Dorfan, et al. 1965. Observation of Antideuterons. Phys. Rev. Lett. 14:24:1003–1006. Retrieved June 8, 2008. ↑ Y. Arata, Zhang Y-C, Fujita H, Inoue A; Koon Gakkaishi. 2003. Discovery of solid deuterium nuclear fusion of pycnodeuterium-lumps solidified locally within nano-Pd particles. Proceedings of the Japan Academy. Ser. B: Physical and Biological Sciences. Retrieved June 8, 2008. ↑ Toni Feder, 2005. Cold Fusion Gets Chilly Encore. Physics Today (January 2005): 31. American Institute of Physics. Retrieved June 8, 2008. Clayton, Donald. 2003. Handbook of Isotopes in the Cosmos: Hydrogen to Gallium. Cambridge Planetary Science. Cambridge, UK: Cambridge University Press. ISBN 0521823811. Dahl, Per F. 1999. Heavy Water and the Wartime Race for Nuclear Energy. Bristol, UK: Institute of Physics. ISBN 0750306335. Feder, Toni. 2005. Cold Fusion Gets Chilly Encore. Physics Today (January 2005): 31. American Institute of Physics. Hassanein, Ahmed. 2002. Hydrogen and Helium Recycling at Plasma Facing Materials. NATO Science Series II: Mathematics, Physics and Chemistry. Dordrecht: Kluwer Academic. ISBN 978-1402005121. Lide, David R. 2005. CRC Handbook of Chemistry and Physics, Internet Version 2005. Boca Raton, FL: CRC Press. Mook, Willem G. 2005. Introduction to Isotype Hydrology: Stable and Radioactive Isotopes of Hydrogen, Oxygen and Carbon. Danvers, MA: Taylor & Francis. ISBN 0415398053. Desktop nuclear fusion demonstrated. New Scientist. Missing Gas Found in Milky Way. Space.com. This page was last modified on 25 October 2017, at 19:08.